Our guests are treated to free breakfasts and Wi-Fi along with a pet-friendly attitude at the Ramada Kingman which is just off the interstate. The adobe-style Ramada Kingman has two floors and 100 rooms that open along exterior corridors. Free Wi-Fi HDTVs microwaves and mini-fridges are all standard. Start the day with the free hot breakfast before getting down to work in the business center or the fitness room. Cool off in the outdoor pool order dinner in the on-site restaurant or mingle at the bar. Extras include a guest laundry and a 24-hour front desk. Parking is free and pets are allowed for a fee. 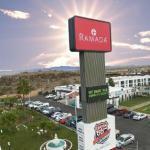 On Historic Route 66 the Ramada is just off I-40 between Las Vegas and Phoenix. The restaurants and shops of downtown Kingman are three miles away and also within three miles are the Kingman Municipal Golf Course the Amtrak Station and the Mohave County Fairgrounds. Guests can stop in to the Route 66 Museum less than five miles away or check out Hualapai Mountain County Park a 20-minute drive. The Grand Canyon Skywalk is just over an hour away. McCarran International Airport in Las Vegas is 102 miles northwest.